Most marine animals have complex life cycles, with two stages, the familiar adult stage, and tiny dispersive stages (usually larvae), which disperse through the plankton. The role of these larval stages has been the subject of considerable attention from marine ecologists in the 1980s and 1990s, because populations of many species, including many commercially important ones, are limited by the recruitment of these larval stages. Recruitment of most species is also highly variable in space and time, and explaining this variability is central to explaining population fluctuations, and for resource managers to identify ways of maintaining or enhancing commercially exploited or vulnerable species. Several components of the larval period are likely to influence recruitment success, especially their dispersal during the planktonic phase, their ability to make an effective transition from larval to adult stage, and their successful establishment after this transition. We could explain 50% of the variation in larval abundance, a figure that represents high explanatory power achieved for a task such as this. The behaviour of fish varied between calm and stormy weather conditions, and that these changes in behaviour modify dispersal. The modelling approach can be used to identify key habitats for a particular species, such as nursery areas for commercial fish species, and allow that habitat to be given special protection. This work provides an important tool that is being used to study larval dispersal in other species. What cues do larvae use to leave the plankton? Settlement of marine animals provides the link between larval and adult stages of the life cycle, and for many years, marine ecologists have debated the extent to which settlement represents control of their fate by these tiny, weakly swimming larvae, and how much they are at the mercy of currents. Resolving these questions has required field experiments in which cues that may induce larvae to attach and initiate their metamorphosis are manipulated experimentally. Even when such experiments are done, it is it is hard to draw generalizations about the importance of settlement cues, because most studies focus on one or a few carefully chosen species, whose responses may not be representative. In a series of papers, we have taken a large group of co-occurring species, and measured their response to a common set of environmental cues. We have shown that there is no simple answer to the question posed above, but that each species uses a given set of cues in an idiosyncratic way. By studying a large group of marine invertebrate species, we can build a picture of the processes by which settlement occurs. Do larval experiences in the plankton influence their success later in life? After settling, animals must survive and grow to enter the adult population as recruits. Because the animals are still tiny, even after they settle, they suffer high mortality, so variation in their early survival might be a major contributor to variation in recruitment. One intriguing suggestion that has emerged in the marine ecological literature in the past few years has been the suggestion that experiences of larvae in the plankton “carry over” to affect their fate later in life. 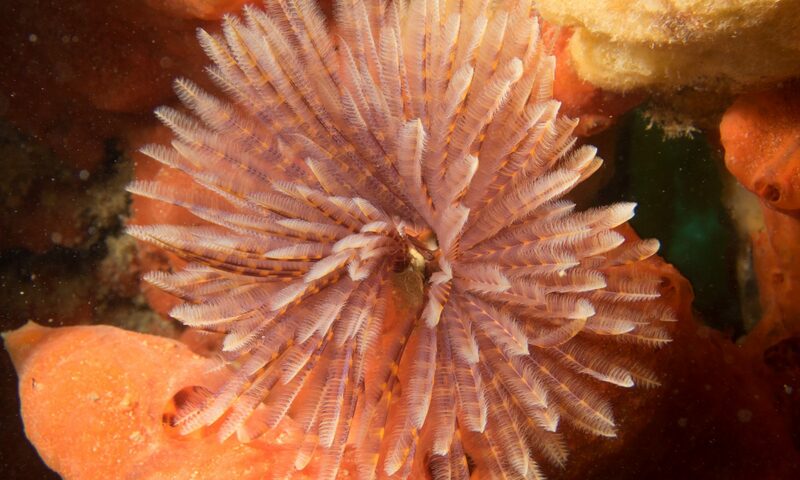 This view is in contrast to widely held earlier views that because marine animals undergo such massive tissue reorganization during metamorphosis, they start life afresh after metamorphosis. We have provided the first demonstration that exposure to pollutants during the larval stage can have serious effects that show up months later in the adults. We have shown that, for a range of species, the energy resources invested in each larva by its maternal parent affects its ability to swim for sustained period, its responses to settlement cues, and its growth and survival after metamorphosis. In collaboration with one of the originators of the carry over hypothesis, Prof. Jan Pechenik (Tufts University), we have shown that levels of larval activity also affect juvenile performance – highly active larvae burn up energy reserves, and have little left for subsequent growth. These results are critical elements in the emerging view that settling larvae are not a pool of very similar organisms, but a heterogenous collection reflecting parental investment, exposure to stresses, and time spent in the plankton. The work leads to the interesting prediction that variation in larval “quality” may explain significant amounts of variation in recruitment of marine animals.